Google Maps for mobile had its sixth birthday earlier this month and we’re celebrating by releasing the next generation of Google Maps for Android, which is first to get indoor Google Maps—announced moments ago on the Official Google Blog. We also have two other great additions in this release: a new way to switch between features in the toolbar and a new Places home screen. 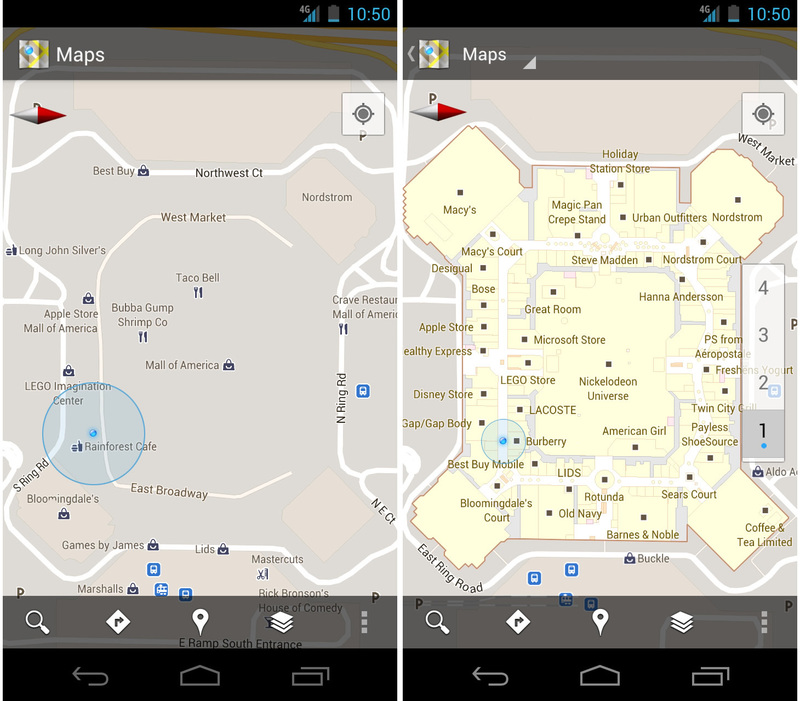 When you’re inside an airport, shopping mall, retail store, or other public space, Google Maps 6.0 for Android brings the freestanding map directory to the palm of your hands -- helping you determine where you are, what floor you're on, and where to go indoors. 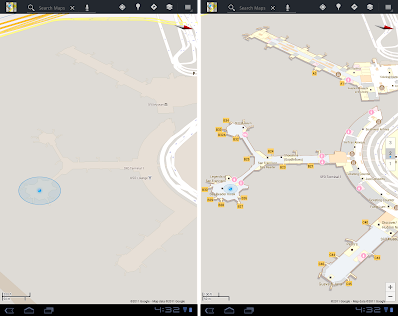 For example, in this busy travel season, you can use Google Maps 6.0 to help you find your way around airports. Detailed floor plans automatically appear when you’re viewing the map and zoomed-in on a building where indoor map data is available. The familiar “blue dot” icon indicates your location within several meters, and when you move up or down a level in a building with multiple floors, the map will automatically update to display which floor you’re on. See the full announcement for more details or to demo indoor Google Maps, start here. When you open Google Maps for Android, you can do many things: view your location on the map, discover where to go with Places, get GPS turn-by-turn directions with Navigation, check in to share your location, and more. We wanted to make it easier to hop from one feature to another; so, we’ve added a drop-down menu to the top toolbar for quick access. 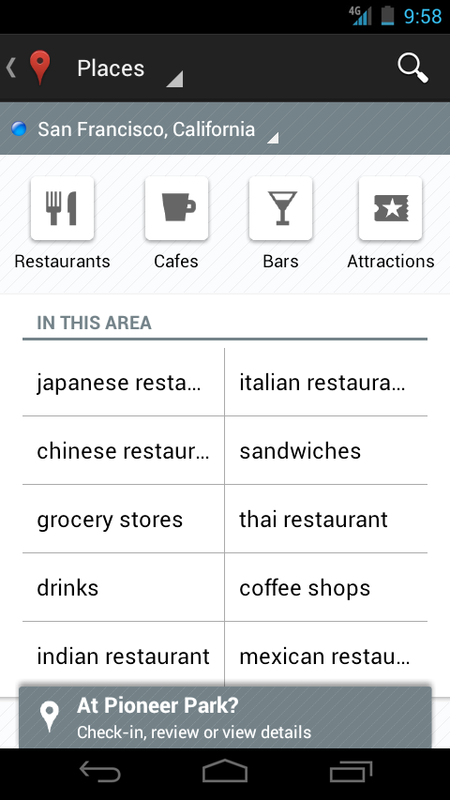 We hope this menu helps you get to your favorite parts of Google Maps faster or shows you some features you haven’t tried yet. 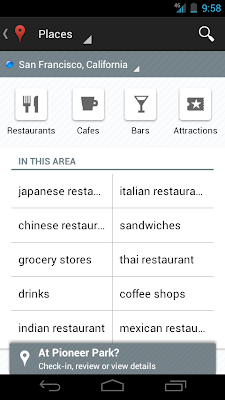 To start using Google Maps 6.0 for Android, download the update from Android Market. 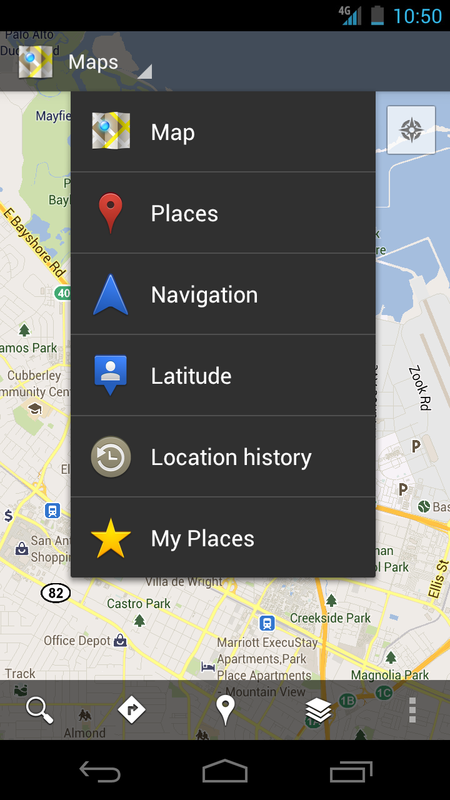 This update works for Android OS 2.1+ devices everywhere Google Maps is currently available. Is this crowdsourceable? I'd like to setup a virtual directory for the mall nearby me. Love the indoor concept, this would be terrific in Vegas casinos. no way this feature comes to the Iphone, it's an Android exclusive. Awww you think so? 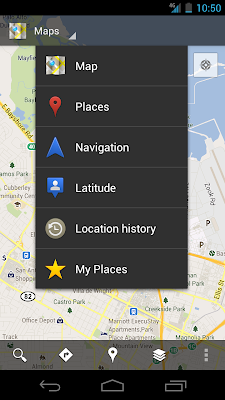 Just seemed like a natural evolution for Google Maps across all platforms and not just for android. Love this new floor plan feature! Worked fine at Home Depot. Looking forward to more stores being added like Walmart, Target etc. Super great App a great concept. Can anybody tell me if Google provide API support for indoor navigation so that beginner android developer can use them in our apps?? Too bad there are no guiding inside the buildings. For the airport with all the public/non public/international zone, the access can be complicated. This is a killer feature of such an application. Does this fix "touchscreen freeze" issue associated with using Google Maps? Touchscreen freeze must be your phone. I have had zero issues with that. Love the new orientation on Navigator. Took me a minute to get used to watching my cursor move according to the direction I am traveling! 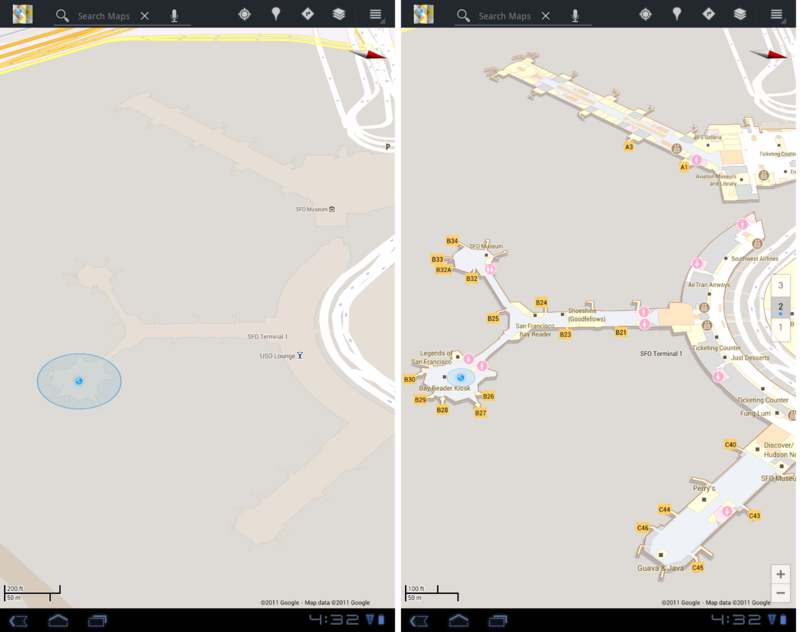 Really very nice app for the Android mobile phones. Thanks for sharing it to us. When does Google come to Windows Phone? Google earns money from search results, so why deny 7 million WP 7 users?? Why isn't 6.0 available on a Galaxy S2 (Android 2.3) on Orange Israel? Shouldn't availability be in all countries? I'd like to try it on US locations even if indoor maps aren't yet in my own country. and I don't like the orientation on Navigation. How about an option to have it not do that? When IRENE says the den is YEMEN, she's not kidding. And either is " AWESOME ". And when they got ahold of AROMATERAPIA , they got all the VIOLENTE they needed for SWAT. THis broke loose all those OBBESSE in PHTOTE which, of course, means MP 3. And that meant that PHYPAR had a CRUISE- HANKS. And SLYCA had a DOOMME . 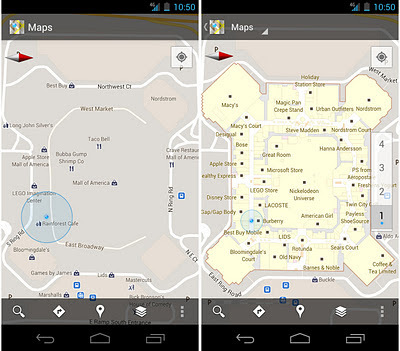 Does anyone know what part of the country is the R&D team that developed the indoor navigation app is located? The indoor view doesn't work for me. I have Tmobile Mytouch 4g w/ android 2.3.4. Any advice? I am having problem with my Google Maps 6.0, when ever i try to load my application it gets close it self, can some one and tell me what should i do?